The siting of the Wyke Down henges on the east side of the Allen Valley close to its source is undoubtedly significant. The stream links the chalky downlands to the Tertiary soils of the coastal plain and where these two geological areas meet some 3 miles (5km) downstream a very large ceremonial complex of monuments developed in the Neolithic and Bronze Age. Here too, at Knowlton, there is evidence to suggest there were significant natural features already present in the landscape that may have influenced the choice of this place. The comet Hale-Bopp overflying the church in Kowlton Church Henge in 1997. Image copyright Phillip Anderton. A substantial Pleistocene river cliff separates the monuments from the valley and stream. Furthermore, a group of at least six anomalous features enhances this boundary where it is closest to the main monument complex. These features, as seen from the air, are reminiscent of the shafts already discussed at Down Farm and Pentridge. Lying very close to the most easterly pair of these features is an oval earthwork that is particularly comparable in form with Neolithic mortuary enclosures, making it likely to be one of the earliest monuments to be constructed in the complex. This juxtapositioning of monuments with natural features is a recurring phenomenon. The principal components of the Knowlton complex consist of four henge monuments and an enormous round mound (the largest in Dorset) which has two concentric ditches surrounding it. The southern circle is the largest in the group being some 230m in diameter. It is bisected by the road to Wimborne, which probably conceals the entrances that have so far failed to show up in any other part of the remainder of the circuit. A small excavation undertaken by Bournemouth University in 1994 cut through the earthwork in the south-eastern quadrant. The ditch was colossal, just under 6m deep and near vertical. Very little survived of the bank after centuries of cultivation but at some stage it had been delimited by two small ditches only 50cm deep. Calculations of the amount of material removed from the ditch revealed it could not have all been contained between these two ditches. It seems likely therefore that the ditches represent a later remodelling of a degraded bank. 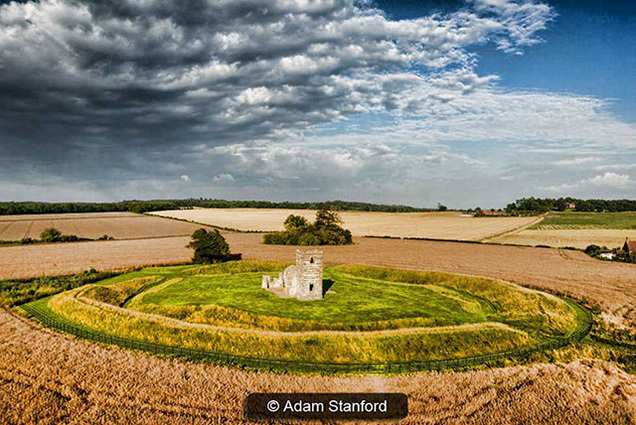 Knowlton Henge – image © Adam Stanford. At the back of New Barn Farm, which is built within the henge, part of the northern circuit of the earthwork is well preserved and the bank width can be measured at some 12m. Lying 140m to the north is the centre circle. This earthwork is one of the best preserved of its kind in the country and receives protection under English Heritage guardianship. It is occupied by the ruin of a Norman church and its attendant graveyard defined by a low bank. The church sits on a low mound and one wonders whether this mound was an original Neolithic feature? The henge is roughly oval in plan with a maximum width of just over 100m. The bank is up to 2m high and the ditch over 1m deep appears rather irregular, interrupted by a number of causeways. Today there are three entrances, although only the eastern one appears to be original. Just to the north of this monument, badly degraded by ploughing, is a smaller circle with a wide entrance to the south east and a roughly square earthwork known as ‘old churchyard’. The latter is likely to be another henge as it has a causeway to the north-east aligned on the entrance to the northern circle although unusually its bank lies on the inside. Google Map of Knowlton Henge. Due east of the centre circle, covered in trees, is the great mound still surviving to a height of 6.5m. Two concentric ditches surround it, one within 5m of the mound and the outer, segmented ditch, set some 30m distant from it. It is possible that this outer ditch, over 10m in diameter, is in fact a fifth henge which enclosed the likely earlier mound. Supporting this hypothesis are some aerial photographs that clearly reveal traces of an external bank. A rescue excavation in 1958 (Field 1962), following a pipe trench which cut the ditch, uncovered a profile apparently less than 2m deep which is admittedly rather un-henge like. However, bearing in mind the causewayed nature of the ditch, the profile could vary significantly around its circuit. Nothing is known of this mound but similar combinations of henges and large mounds are known in other parts of the country — notably at Arbor Low in Derbyshire, Marden in Wiltshire and the most extreme example of all Silbury Hill and the Avebury complex. The large Neolithic round mound Duggleby Howe on the Yorkshire Wolds is now known to lie at the centre of a surrounding causewayed enclosure (Selkirk 1980). Silbury Hill is known to date from 3000 BC and it is likely that the other mounds are of broadly similar date. Google Streetview of Knowlton Henge. Surrounding the remarkable group at Knowlton are numerous round barrows, now mostly only visible from the air, including several of two phase construction. Using the great mound as a centre point of a 1km wide circle, around 60 barrows are now known within this area and numbers are likely to increase with future aerial survey. Some seem to form an avenue approaching the site from the south-west. The greater percentage of these mounds are likely to be of Bronze Age origin attesting to the continuing importance this place held for succeeding generations. Indeed, the construction of the church within the central henge in the twelfth century, 0.5km from the medieval settlement, is an eloquent reminder of continuing pagan beliefs and the clergy’s attempt to integrate them with Christianity. We have seen how the construction of the Dorset Cursus created a huge spinal earthwork, stamping the landscape through which it crossed with special sacred status. Once built it acted as a focal point, and sites like those found on Down Farm reveal increasing evidence of more sustained settlement and an expanding population through the third millennium BC. The sheer range and number of smaller ceremonial earthworks, created to embellish and enhance the Cursus line, are evidence of this consolidation. The discoveries made on Wyke Down suggest such monuments are only one component of an increasingly ordered and settled landscape.